Nothing beats good coconut candy to put a smile on your face. IT’S FUNNY that a simple concoction of grated coconut, sugar, condensed milk and flavouring can melt the heart of even the most difficult person. 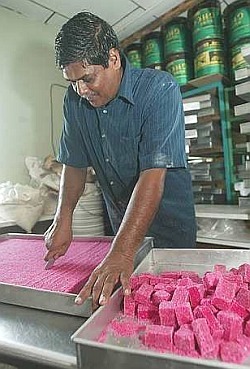 Coconut candy is popular in Malaysia and there can be quite a fiery debate when candy makers come together, as to the exact measurement of ingredients for this sweet. The measurements have to be rather precise, or you might end up with either rocks or a candy that will not harden or set. While it used to be a popular offering at convenience stores in the late 1970s through the early 1990s, now it is found only in homes during the festive season. Except for several restaurants that sell Indian sweets, it is almost a mission impossible trying to get a taste of it elsewhere. Sugar fix: Delicious coconut candy that turns tigers into purring kittens. One downside of making coconut candy is, of course, the tedious and intense stirring it entails that often ends with the cook getting burns from the spitting of the boiling candy. However, if the candy is done right, it will disappear very quickly once it is ready. This is also a sweetmeat that Indians are very fond of. If you are really into sweets, then this would be one of the candies you should look for in shops that sell Indian sweetmeats or during festive occasions. It is also a good challenge to try making this sweet at home. Besides the ingredients that have been mentioned, the one other ingredient that is crucial to the success of turning out good candy is patience! Without patience, the candy will not turn out right or be what you want it to be. The coconut you choose is also important. Use old coconuts rather than young ones as the taste is better and if possible, check that the shops that grate the coconut do not grate the shell into the coconut as this often can cause choking and if the shell chips off, it can be rather sharp and would spoil the pleasure of eating the candy. It is again difficult to suggest where it can be bought but do try the Indian shops that pepper the cities and towns, and chances are you may be able to find either the red or green variety but the coffee candy is definitely one that can only be had in homes, personally made by the the lady of the house. Put the grated coconut, sugar and condensed milk into a pot and cook over a medium heat until the sugar starts to dissolve. Lower the flame and use a wooden spoon to stir the candy to prevent it from burning on the sides of the pot. When the ingredients are well-mixed, i.e. the candy will look smooth, add the butter and flavouring. Continue to stir until it is thick. To test if it is ready, put about half a teaspoon of candy into a glass of water. If it remains firm and doesn’t break, then the candy is done. Remove from the fire and quickly pour the mixture into a tray. Using plastic to protect your hands, gently compress the warm candy into the tray or use a rolling pin to do so. Allow it cool and harden for about an hour or so, before cutting into diamond shapes or squares. Ensure the candy is really cool before storing as coconut can turn rancid and spoil quickly if it is covered with moisture from the steam.